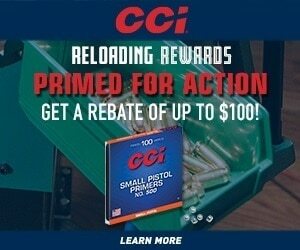 Welcome to the Cheap Ammo Rebate Center! All rebates offered by the manufacturers are gathered here with links to the details and forms for your convenience. Please note that none of these rebates are offered by Cheap Ammo or any of its affiliates, all rebates are fulfilled at the discretion of the product manufacturer. Spend at least $20.00 on any Federal® turkey ammunition to get 10% of the purchase price back (maximum $20.00). Choose to keep the rebate or direct it to the National Wild Turkey Federation. Product must be purchased between 2/1/2019 through 5/31/2019. *Qualifying products limited to: American Eagle® Varmint & Predator, Federal Premium® VShok®, Nosler® Ballistic Tip® Varmint & Predator, Speer® TNT Green® Varmint & Predator and/or Federal Varmint & Predator ammunition. Maximum rebate $100. 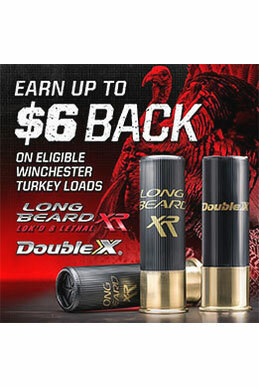 Between January 15, 2019 and May 31, 2019, earn $3.00 back for each box of Winchester turkey loads you purchase. Rebate is in the form of a check. Minimum rebate amount is $3.00 (1 box). Maximum rebate amount is $6.00 (2 boxes.) Offer is valid on qualifying purchases made between January 15, 2019 – May 31, 2019. Offer expires and all requests must be received by June 15, 2019. Allow 6-8 weeks for delivery. Click here to print the redemption form.